First Line: Ruby was used to keeping out of the way when her mother had visitors. Detective Chief Inspector Henry Johnstone is sent to Lincolnshire when three freshly-buried bodies are uncovered in the yard of a rented cottage. Two of the victims are identified as Mary Fields and her seven-year-old daughter Ruby, but the third remains unidentified. Johnstone is determined to use the latest detection and forensic techniques 1928 has to offer, but his determination and modern thinking ruffle the feathers of the local constabulary. He soon fears his investigation is going nowhere...and then he's called out to another murder. 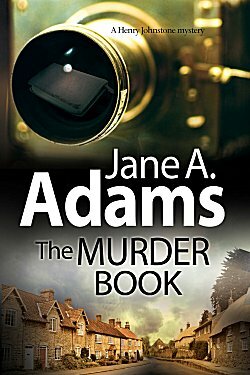 Author Jane Adams does an excellent job of portraying life in the small villages and farms of England during the Depression. Her depiction brought me right into the story. Detective Chief Inspector Henry Johnstone is an extremely goal-oriented man who, thankfully, has Detective Sergeant Mickey Hitchens with him to bring in the personal touch that makes the natives more cooperative. The writing style of The Murder Book reminded me of Jack Webb's portrayal of Sergeant Joe Friday in Dragnet-- just the facts, ma'am. This type of delivery kept the pace moving right along even though it kept me at a distance-- and I'm the type of reader who likes being in the middle of the action. I didn't let that keep me from enjoying the mystery; however, because this is a convoluted investigation whose resolution only becomes clear due to Johnstone and Hitchens' sheer, dogged determination. I only had one real disappointment in this book, and it's what gives The Murder Book poignancy-- my favorite character was seven-year-old Ruby. What a marvelous little girl, and she was killed in the prologue! As a reader, it made me even more determined to learn the identity of the killer. This sounds like it has a solid historical setting, Cathy. And that 'small village murder' plot point can work really well. Glad you liked this. That "small village murder" device did work extremely well in this book. I dont like unfinished business, leaving it for the next book maybe, because I may not be able to get the next book! Many readers don't like unfinished business, and I can understand why.